Moritz Föllmer traces the history of individuality in Berlin from the late 1920s to the construction of the Berlin Wall in August 1961. The demand to be recognised as an individual was central to metropolitan society, as were the spectres of risk, isolation and loss of agency. This was true under all five regimes of the period, through economic depression, war, occupation and reconstruction. The quest for individuality could put democracy under pressure, as in the Weimar years, and could be satisfied by a dictatorship, as was the case in the Third Reich. It was only in the course of the 1950s, when liberal democracy was able to offer superior opportunities for consumerism, that individuality finally claimed the mantle. 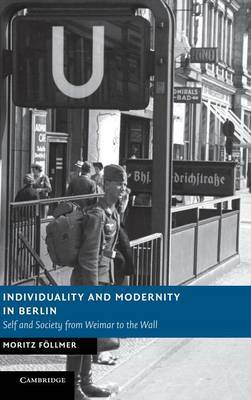 Individuality and Modernity in Berlin proposes a fresh perspective on twentieth-century Berlin that will engage readers with an interest in the German metropolis as well as European urban history more broadly.